“Atcherley artefacts” are objects made wholly or partly by a member of the Atcherley family, and/or objects bearing the Atcherley name. I will share here, any images of Atcherley artefacts which I am given permission to use, or which are in the public domain. 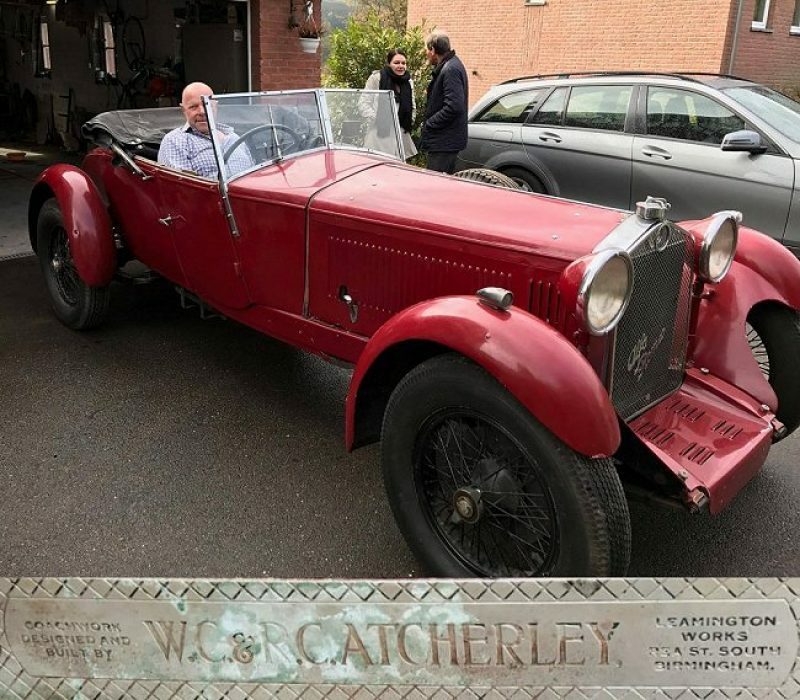 William Clive Atcherley, known as Clive or W C Atcherley, produced coachwork for a wide range of motor cars from the 1920s onwards. 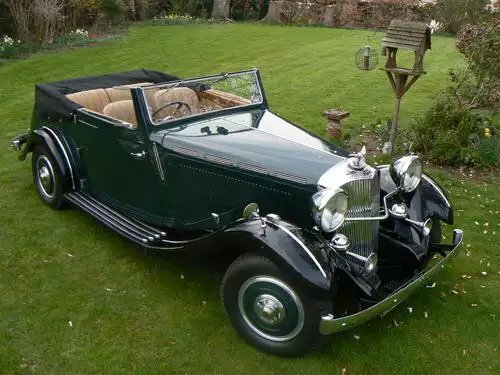 However he is best known for the coachwork he provided for the Brough Superior cars of George Brough (who was himself better known for his Brough Superior motorcycles). Currently (May 2016), there is a beautifully restored Brough Superior available for sale, and I am grateful to Peter Gibson for giving me permission to use his photos of the car here. Check out the Car and Classic website for more information – and more pictures – of this vehicle. Other motor car manufacturers for which Clive worked include Alfa Romeo. Below is a composite image of one such car, and the manufacturer’s plate on the body. 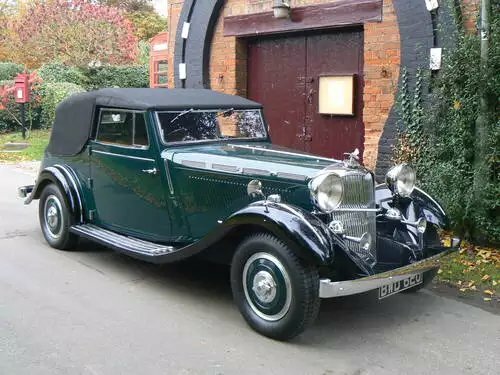 In this case, it was Clive and his brother Robert Clifford (“Cliff”) Atcherley who were responsible for the coachwork, as they worked in partnership in the early years of the business. The man in the driver’s seat is none other than Cliff’s grandson David Atcherley, who bought this classic car earlier this year and who gave me permission to use the photo on this website..
You can read about Clive (and his brothers) during the First World War in Brothers in Arms: Four Atcherley siblings in World War One – Part 1. Ethel Atcherley (1864 – 1905) was a talented artist who produced many delightful watercolour paintings of British landscapes. 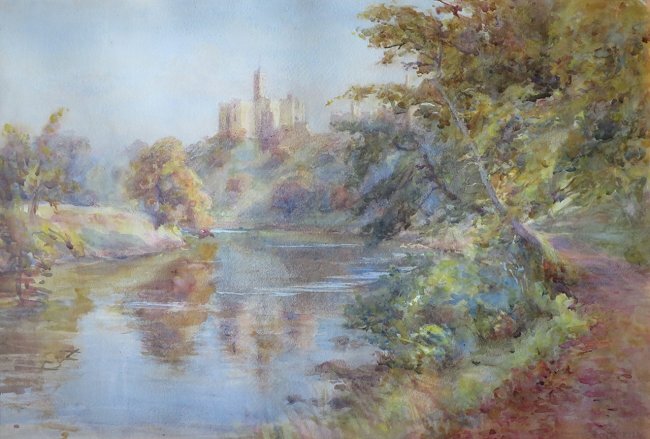 I can share an image of one of those paintings, Warkworth Castle, here, thanks to Martin Atcherley. To learn more about Ethel and her work, see The art and soul of Ethel Atcherley. Henry Mount Langton Atcherley was the son of Lieutenant William Shairp Langton Atcherley, and a grandson of Captain James Atcherley (both of the Royal Marines). He made his way to New Zealand where, after fighting in the Maori wars, he worked as a Government surveyor. He supplemented his income by the sale of his marvellous paintings of New Zealand (and also Australian) scenes. 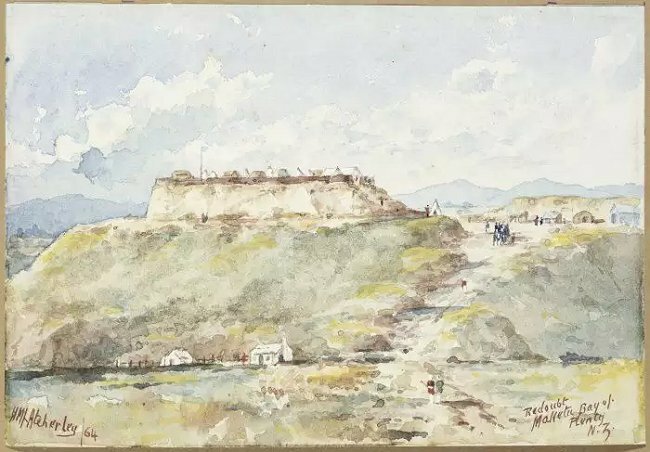 The picture above, painted by Henry in 1864, is titled Redoubt, Maketu, Bay of Plenty, N.Z. and comes from the Collections of the Alexander Turnbull Library website. For more examples of Henry’s work, see this page on the Australian Art Sales Digest website. 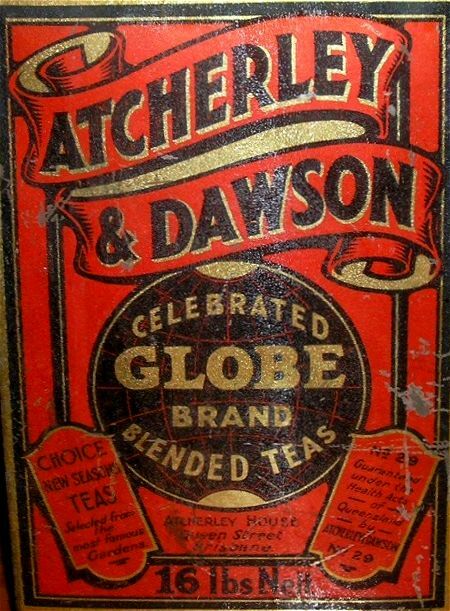 Atcherley and Dawson tea tins, particularly early examples, are much sought after by collectors. The company was established in Australia by Stephen Atcherley and Thomas Dawson, and it continued under their names for many years after their deaths. The image below is adapted from a photo kindly provided by (and © copyright of) Carol Manttan. The story of Stephen Atcherley is included on this website as An Atcherley in Australia.